Being a Scottish girl myself, there is nothing more important to me than my heritage and my love for the Scottish Fashion Industry. Here at TellusFashion we are avid fans of British Fashion in general and I truely believe that we, as a country have one of the most adventurous and innovative fashion offerings. However, I do feel there is a stronger focus on London – which isn’t a bad thing – I just feel that the Scottish Fashion Industry isn’t given the credit its due. My blog post today will not dismiss any other cities or countries but will merely highlight that Scottish Fashion is one to keep an eye on. Scotland has always been famous for its traditional fabrics tartan, cashmere and in particular the Harris Tweed. The Harris Tweed is a speciality to the northern isles of the country which is traditionally hand-spun, hand-woven and dyed. The tweed itself is becoming more sought after on a global scale and has modernised by designers, making it a much more desirable fabric. Its not unusual to see the fabric adorning catwalk collections belonging to the likes of Vivienne Westwood, Jean Paul Gaultier, Prada and Calvin Klein who have brought the tweed to life. Also, who could forget the use of Scottish Tartan by the late and great Alexander McQueen. It simply goes to show how fabrics which have been produced for hundreds of years in Scotland have so much influence over such amazing designers. Its not only our fabrics that we should be respected for, but our talented designers – Christopher Kane, Jonathan Saunders, Louise Gray. All of these designers were born and bred in Scotland and have had substantial input in the fashion industry. 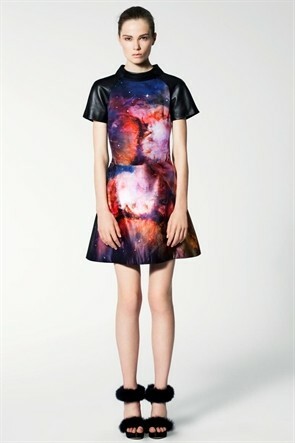 There is without a doubt that Christopher Kane has been an inspiration to Fashion and is well known for his graphic prints and neon brights. 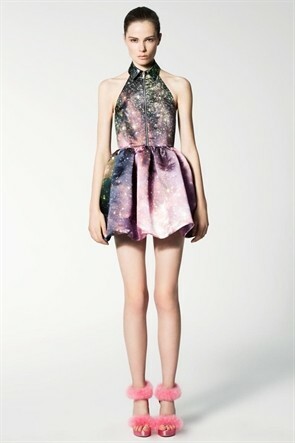 His pre-collection for SS11 was one of my favourites, I am so in love with the Galaxy print. I think its gorgeous..
What is more exciting now is the fact that this industry in Scotland is becoming bigger and this has been recognised by the fantastic Scottish Fashion Awards. Its brought the work of Scots in the Fashion Industry to the forefront. Its things like this that give us more passion to build on our own little segment of the industry and its making me more determined as a ‘soon to be’ graduate of Fashion, to become a part of this! So if you are ever in Scotland or if you live here too appreciate what we have on offer, come to a city like Glasgow and see the talent coming out of The Glasgow School of Art and Glasgow Caledonian University’s Fashion schools or what check out the amazing array of shops including vintage fairs and pop ups too like Granny Would Be Proud or Bold Souls. There is so much here that would get a fashionista’s heart racing. Its why I love Scottish Fashion. This entry was posted on March 22, 2011 by Heather Mhari. It was filed under Fashion and was tagged with Bold Souls, British Fashion, Calvin Klein, Christopher Kane, Fashion Heritage, Glasgow Craft Mafia, Granny Would be Proud, Harris Tweed, Jean Paul Gaultier, Jonathan Saunders, Les Garcons de Glasgow, Louise Gray, Prada, Scottish Fashion, Scottish Fashion Awards, TellusFashion, Vivienne Westwood.